Low back pain…the worst. We’ve ALL been there. You picked something heavy up incorrectly, you spend 8 hours of your day in a chair, or maybe you’re suffering from a running back injury. One common culprit of a running back injury is weakness through the core, more specifically the deep stabilizer muscles. A lot of us tend to “default” to an overextended, mildly arched low back, which causes the core to turn off, leaving the low spine to absorb each step of impact as you run. Correcting this arch and finding a more neutral spinal position is critical if you’re going to keep running, without pain that is. You’re simply going to lay on your back with your feet flat on the ground. From here you’re going to peel the legs up to create a “table top” position, both legs bent at a 90 degree angle, knees directly over the hips. Head is resting on the ground. 1) Peel the head and shoulders off the ground, keeping arms into your sides but lifted 2 inches off the ground, palms up. 2) From here, you can raise the arms above your hips, perpendicular to the ground. 3) From here you can extend one leg, or one arm out in line with your ears, or both legs and/or both arms. The only rule is that your low back MUST, MUST, MUST stay glued to the ground! The whole purpose of this is to turn on those deep abdominal muscles, which support and protect your spine from defaulting to a dangerous position. Start with holding your chosen position for 10 seconds, for 6 rounds total. Increase time as needed. Fixing lower back pain: Open Up Those Hips! The other part of the puzzle is your hips! No doubt they are tight and putting extra pressure and strain on your spine. My guess is that when you AREN’T running, a lot of you are spending MANY hours a day seated…in your car, at your desk, on your couch. Since your hip flexors spend most of their day in a shortened position, the result is that when you do try to find an upright, lengthened out position for that hour or two of running, the low back feels overridden and yanked by them. The result: your low back ends up working extra hard to counteract the pull from the front of the hips. Enter your chronic low back pain and thus, your running back injury. So, let’s open those hips up! Start by standing neutral on two feet, pulling the ribs down and slightly tucking the pelvis to find a neutral spine. From here just start finding some rotations side to side, twisting the upper body from the lower body. You should start feeling a light stretch through the front of the hips. From here go ahead and put your right leg back behind you, finding a shallow lunge position. Continue rotating the upper body, side to side. 1) Extend the arms to increase the range of motion, emphasizing the twist towards the right leg. 2) If that still feels okay, keep arms extended (but now the right arm is raised high, while the left arm is extended low) and now emphasize the twist toward the other (left) leg. 3) From here, your goal is to find an increasingly larger range of twist over your left side, trying to reach that right glute of the extended back leg, then that hamstring, then the knee, then the ankle…you get the idea. The goal here is to create a dynamic stretch that counteracts the seated position we spend so much time in. Accumulate up to 30 twists per side, starting from a small range of motion and increasing from there. 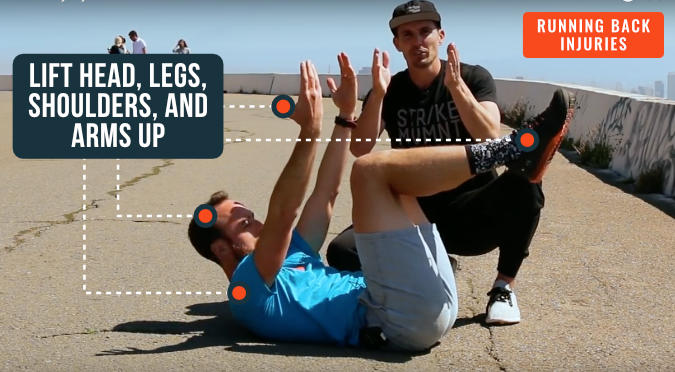 Including these two exercises in your running workout plan will definitely help in both-curing AND preventing running back injury! And for sticking with us to the end…go ahead and take a look at this awesome injury prevention series we put together. 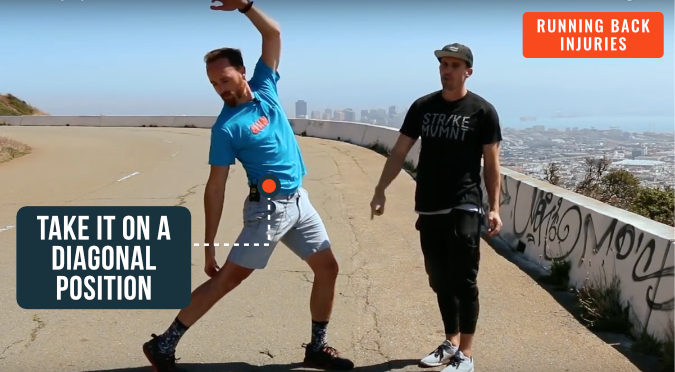 In these videos, we hit on some super common running injuries and give you our best methods for treatment & prevention. Get it all here!